My name is Erica Jackman and I blog over at Kitchen Table Quilting. I am so happy to be sharing this project with you and I hope that you enjoy this fun little project that brings lots of pretty Valentine colors into your home! 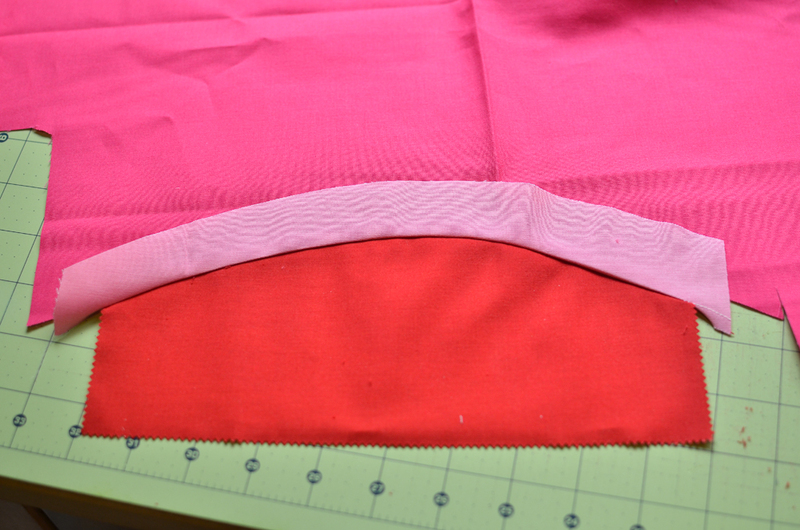 1/4-1/2 yard Bella solids in various shades of white, pink, and purple. I used 30’s Pink, Shocking Pink, Azalea, Orchid, and White. 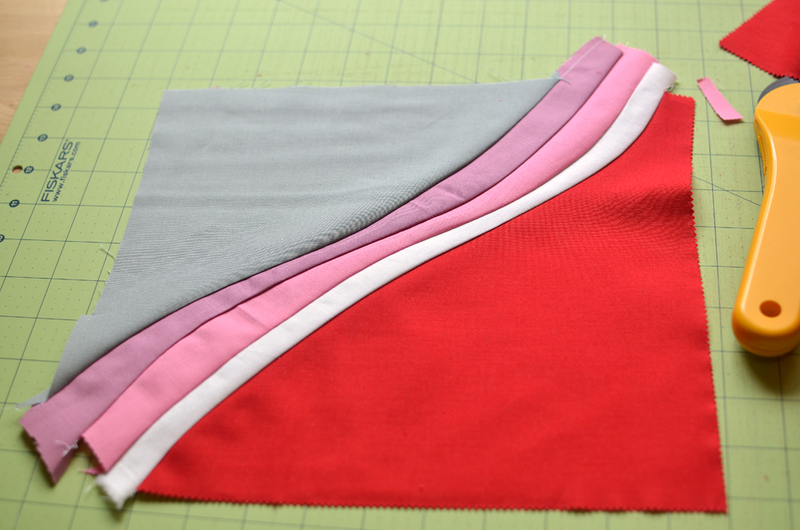 1/2 yard cuts of 4 neutral Bella solids. I used Steel, Silver, Graphite, and Pewter. 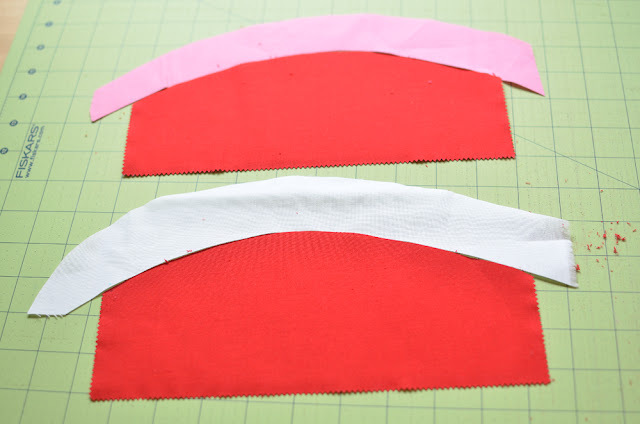 For each heart we are going to need to make 4 blocks: two curved pieces for the top of the heart and two angled pieces for the bottom of the heart (one in each direction). 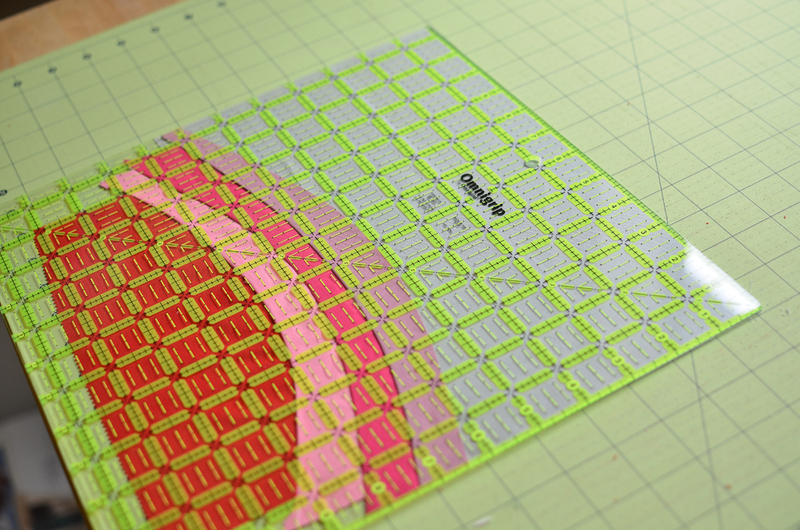 The more exaggerated you make your cuts, the more heart-like your finished project will be. 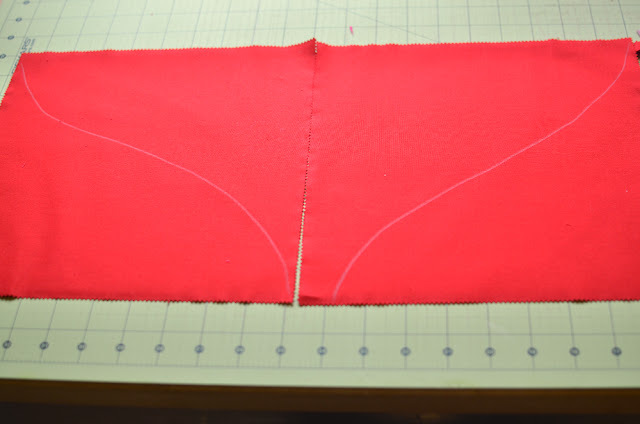 But remember that steeper curves are more difficult to sew, so don’t get too carried away 🙂 You want there to be some variation between your blocks, but you still want it to look like a heart. For each heart you will need 1-2 layer cake squares depending on how big and how exaggerated your heart shape is (I was able to cut one curve from the top of the square and one curve from the bottom). 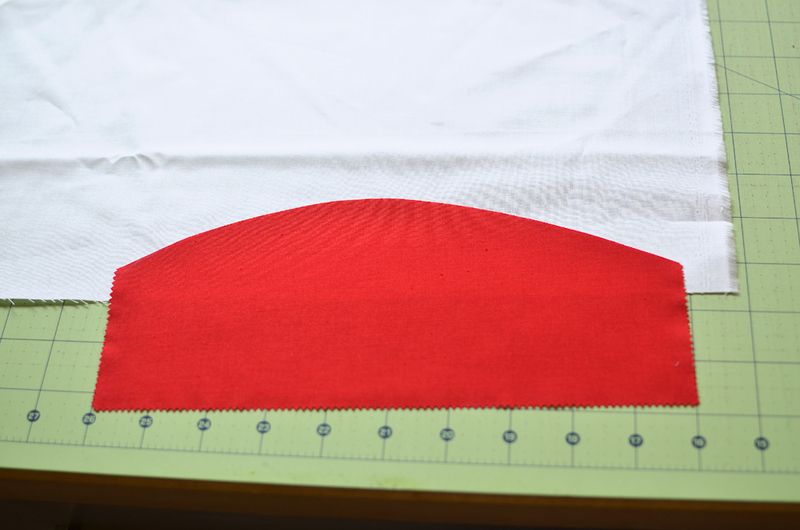 I am not much of an artist, so I roughly drew the curved shape onto my fabric with a chalk pencil. Starting 2-3 inches from the bottom, draw an arc across the length of the square. It doesn’t have to be symmetrical. Cut along the arc. 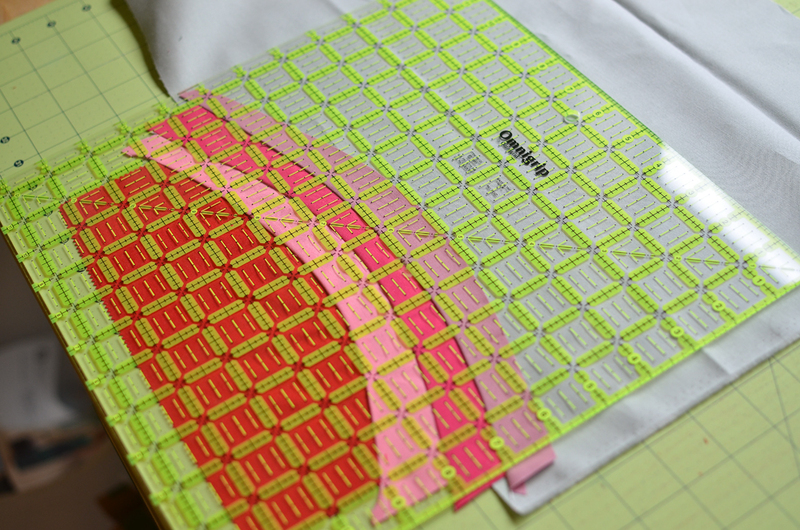 I like to use a small ruler to help guide my rotary cutter as I cut the fabric. It helps keep everything from sliding around. Your fabric should now look something like this. 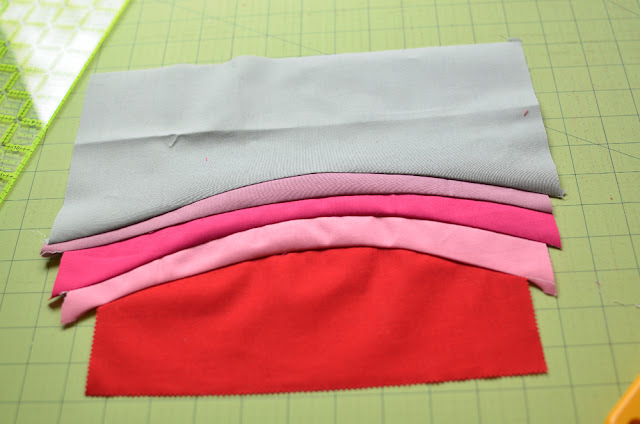 Choose another fabric and lay it on your cutting mat. Put your heart shape on top of it. 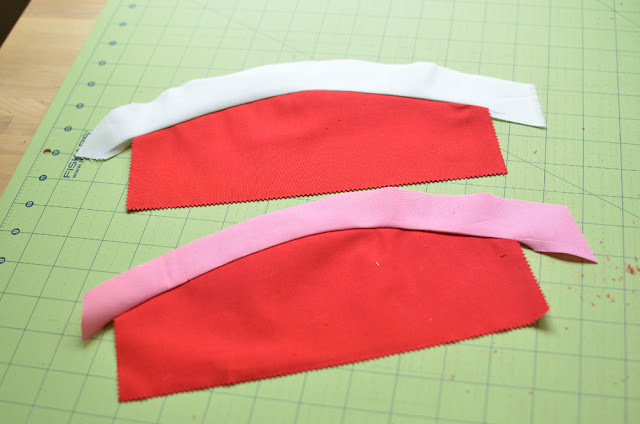 Make sure you have at least a quarter inch of fabric to the right, left, and bottom of where you overlap your heart shape. 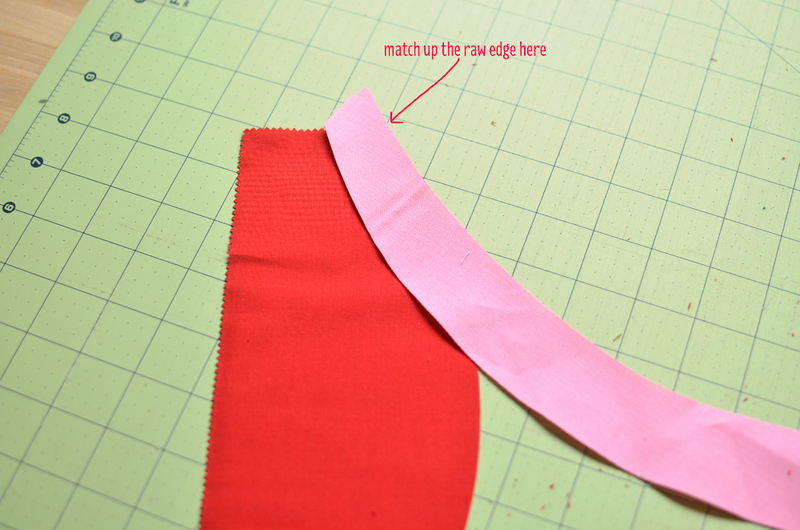 You need to account for the seam allowance. 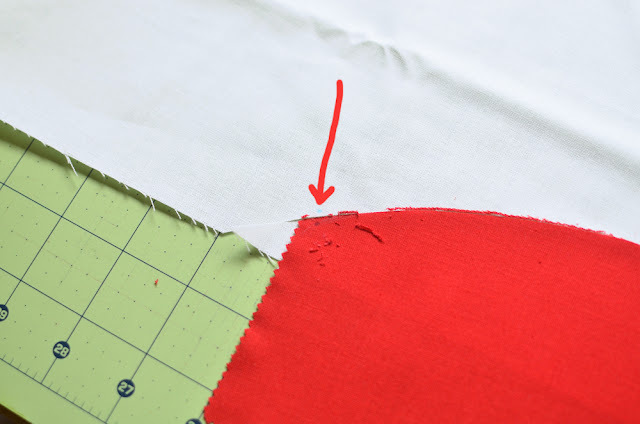 Using your rotary cutter, cut the white fabric using your heart shape as a guide. 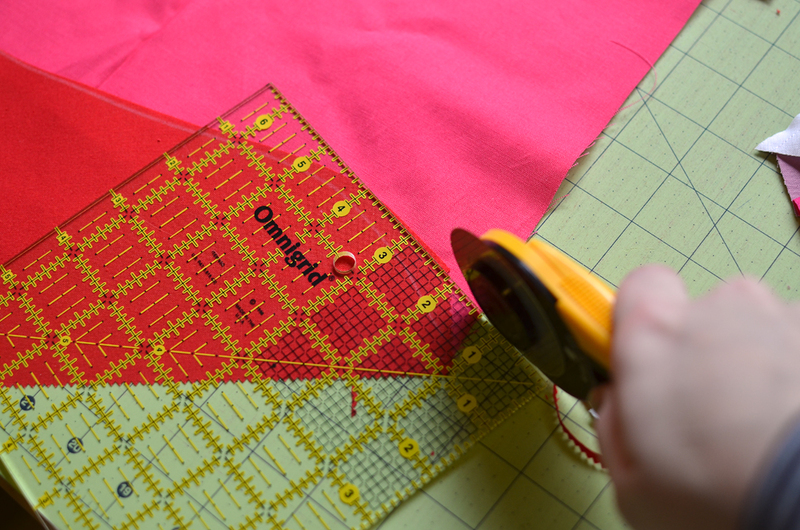 I like to use a washable fabric pen to put a dot at the same spot on each fabric so I can line them up easily when I piece them together. 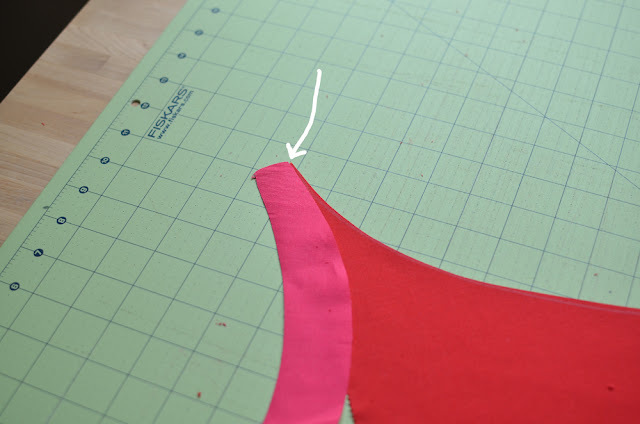 I am not a fan on pinning improv curves, especially when the curve is this shallow. Just line up the top of each piece. And then use one hand on each fabric to guide them under the presser foot. 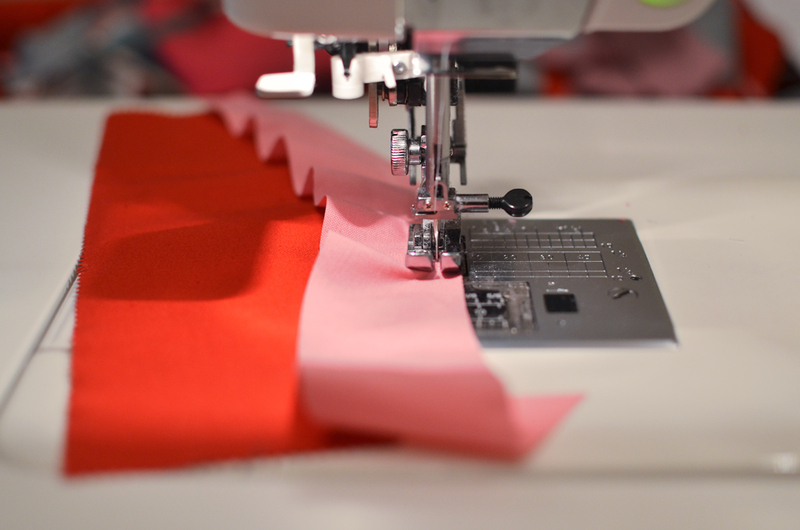 It takes a little practice, but it much faster and easier than pinning. Your pieces should now look something like this. If you think it would help, you can clip the seam allowance a little bit to help the curve sit flat. I didn’t think it was necessary. 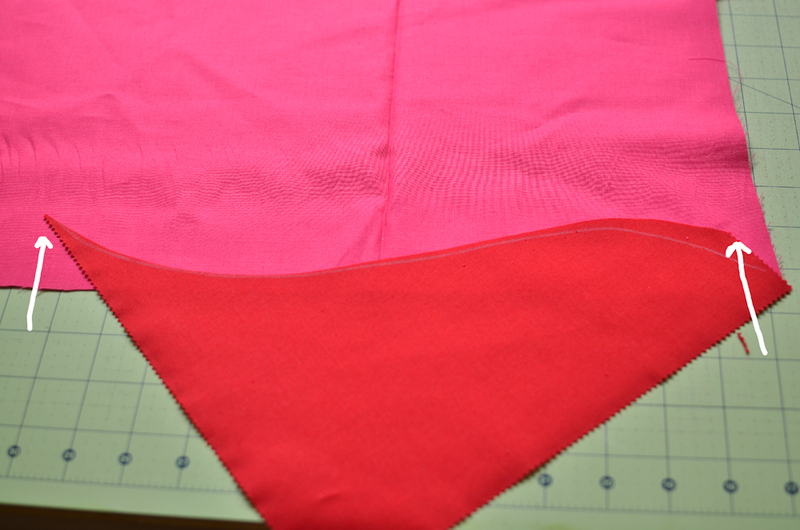 Very, very carefully press the seam allowance toward the outer (non-red) piece. 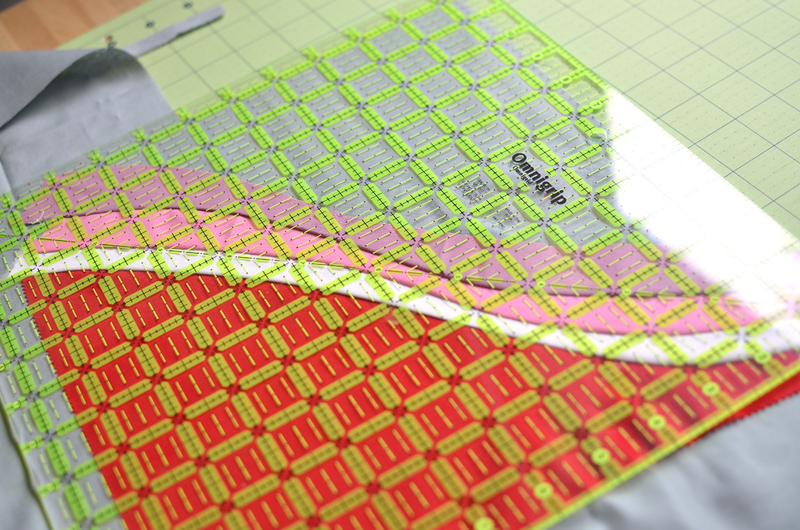 You don’t want your fabric to stretch. 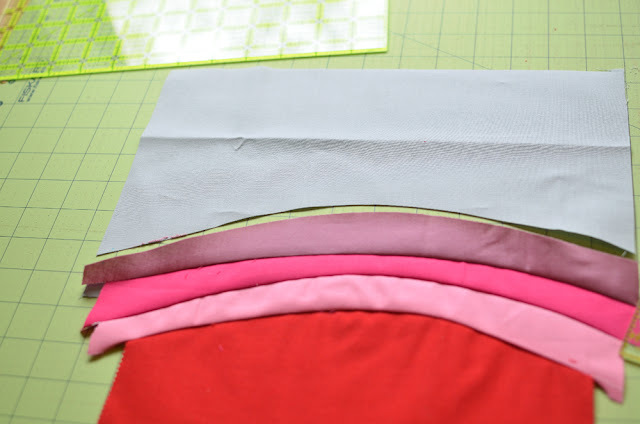 Repeat this step with another color of fabric, making sure again to allow for the same allowance on the right, left, and bottom of the fabric. Using the light pink fabric as a guide, I cut the darker pink fabric and then cut another improv curve a couple inches higher on the pink fabric. Sew the pieces together just like before. Continue adding more colors as desired. I found that I liked the look of 3 added colors on top of the red layer cake fabric. 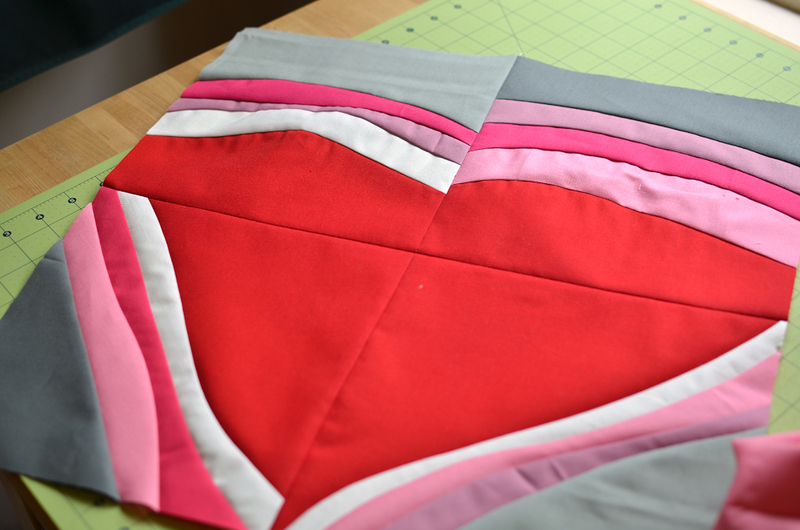 Choose a neutral fabric to make you heart a square and put your heart piece on top of it (remembering to leave room for the seam allowance). 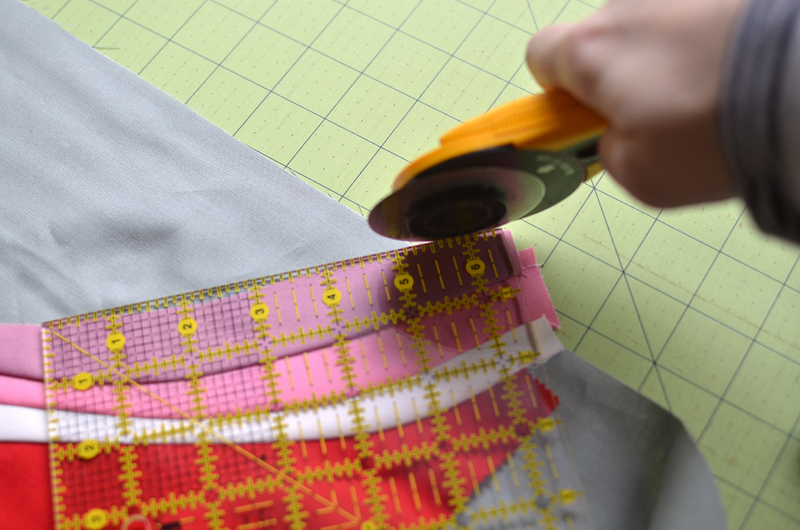 To make sure that you have a large enough piece, place a square ruler (if you have one) on top of the fabrics. My squares finished up at 9.5″ square and I like to make sure that I am not short on fabric, so I lined my fabric on the bottom with the 11″ mark and then centered the square ruler over the fabric. 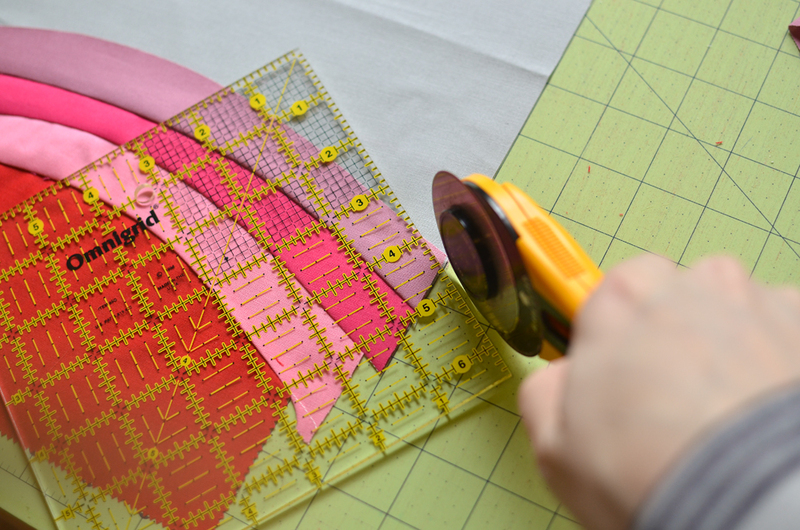 Use your rotary cutter to cut along the right, left, and top of the square ruler. Now use your ruler and rotary cutter to cut along the outer curve of the heart shape. 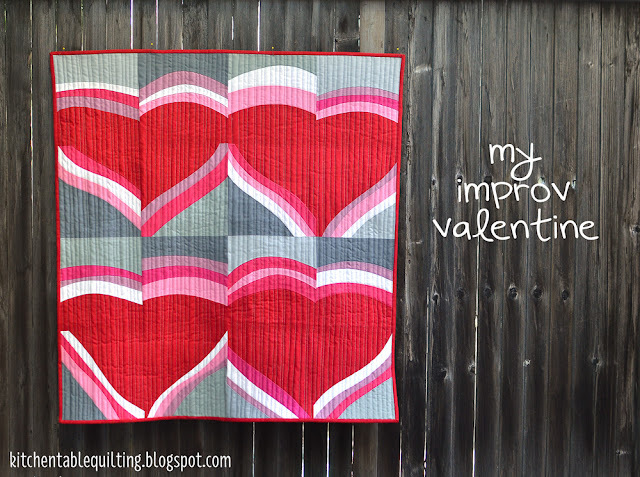 Sew the gray piece to your heart shape just like you did with the other improv curves. Use a ruler to square it up. My blocks finished at 9.5″ but you can use whatever size you want. 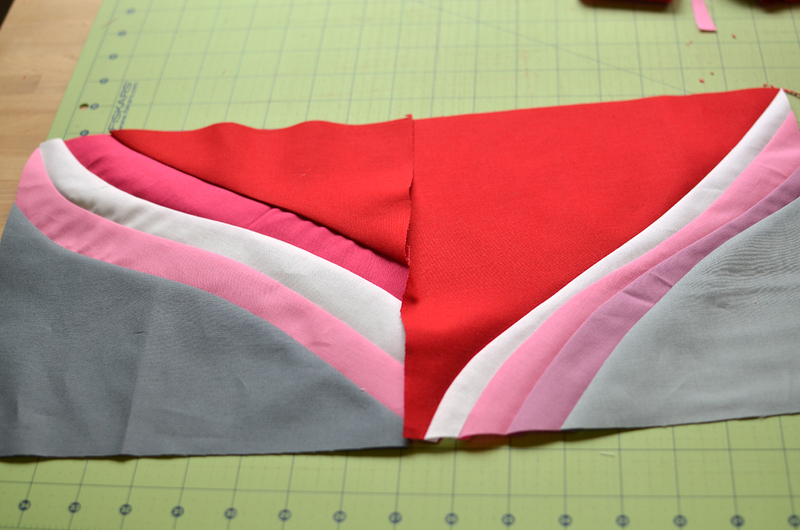 I found it helpful to make these in pairs so that I made sure I was making them angled in the right direction. 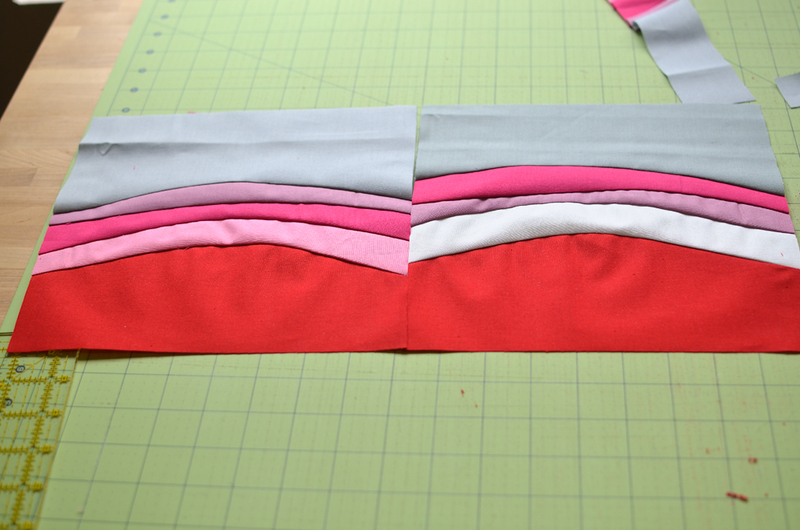 Take two layer cake squares and place them next to each other on your cutting mat. Using a chalk pencil or other water soluble marking instrument, draw the bottom half of a heart across your squares. Cut along these lines with your rotary cutter. Now that you are a pro at piecing improv curves, this next part should be nice and easy. 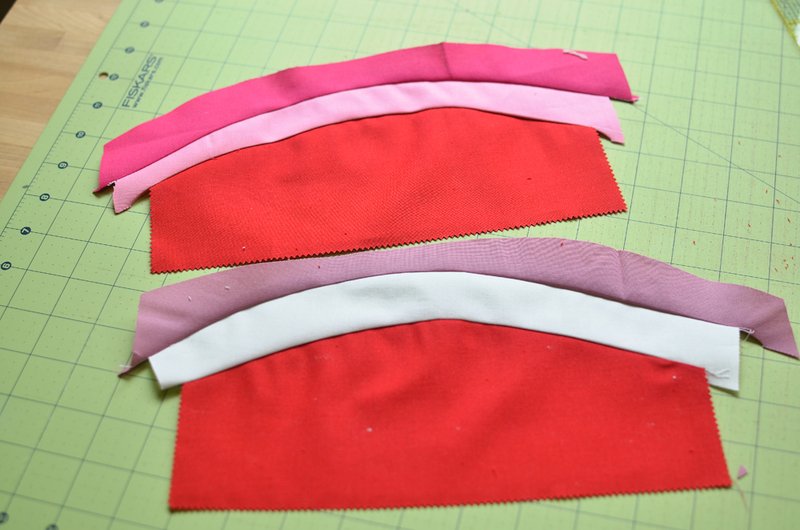 Place your heart piece on top of another color of fabric. Remember to make sure that you overlap more than 1/4″ on the right, left, and bottom from the edges of your heart shape (where the arrows are pointing). 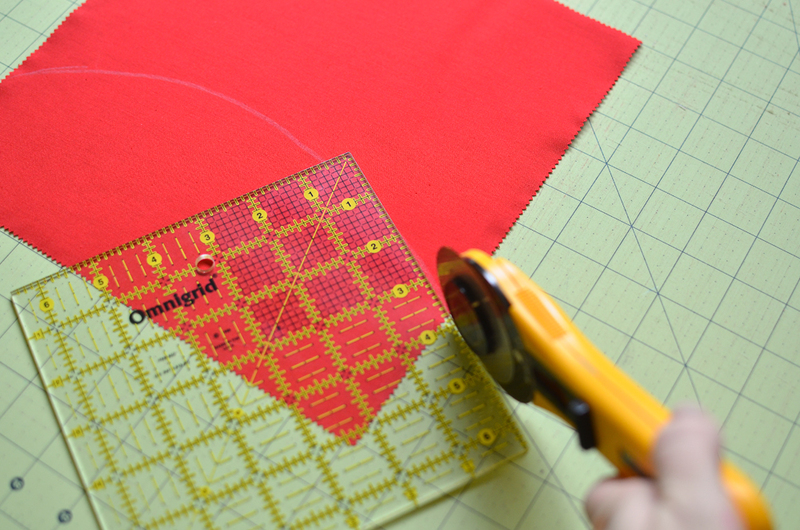 Cut the new fabric with your rotary cutter using your red fabric as your guide. 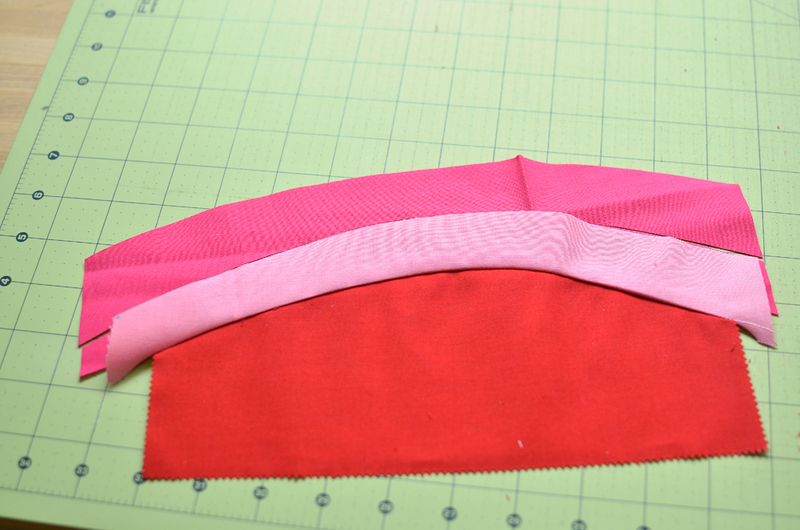 Echo the curve shape a couple of inches up on the pink fabric. Line up the raw edges of each fabric (where the arrow is pointing) and sew together. 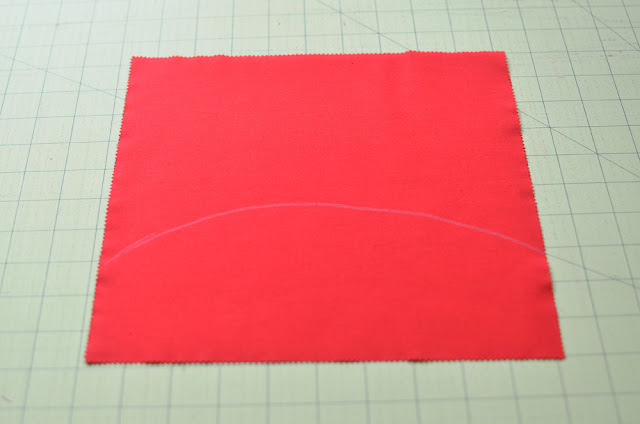 Carefully press your seam allowance toward your new fabric. 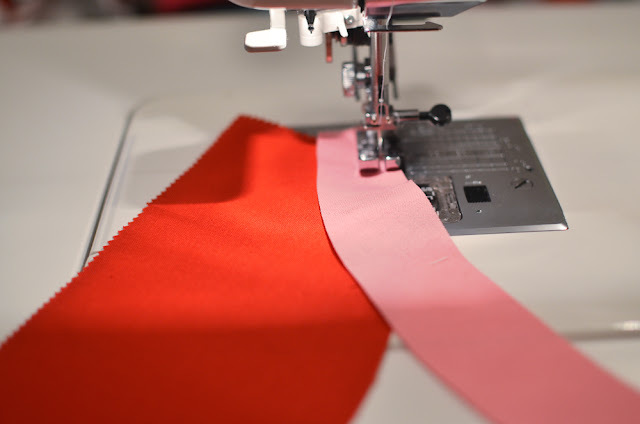 Continue adding new fabrics until you are happy with how your heart looks. 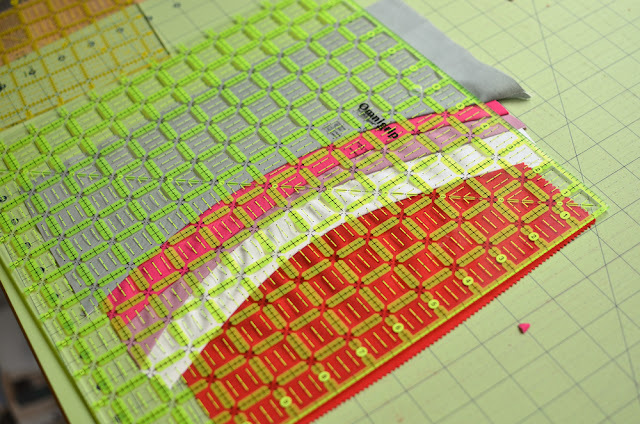 Cut along the top and the side of your ruler that is opposite your improv curves (in this photo that side in the upper left of the photo). Remove your square ruler and cut the neutral fabric using your heart piece as your guide. 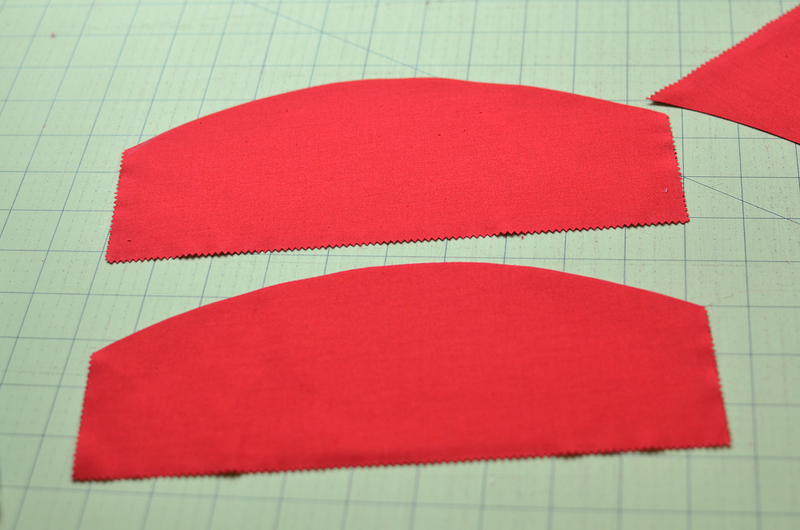 Sew the neutral piece to your curve You should now have something that looks like this. Trim to your desired size (I used 9.5″). If you end up with one or two squares that are more improv-y and wonky than the other, I think it helps to pair them with squares that are more normal looking. I would not put these two together because the bottoms meet at such different levels. 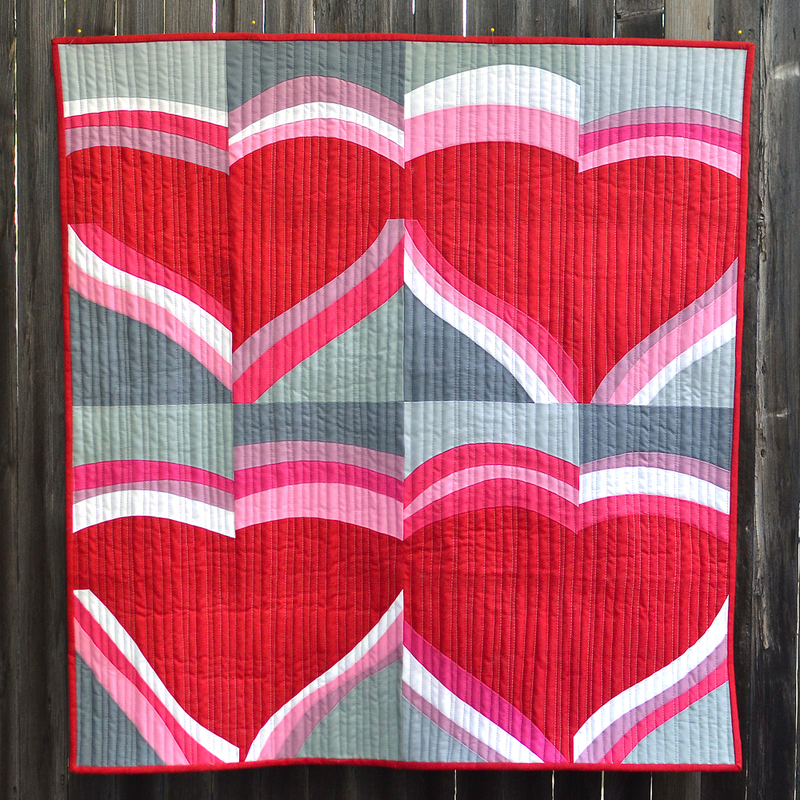 Once you have made enough blocks for 4 total hearts (that means 8 top-of-the-heart pieces and 8 bottom-of-the-heart pieces) arrange the blocks in a way that you are happy with. Sew them into pairs. 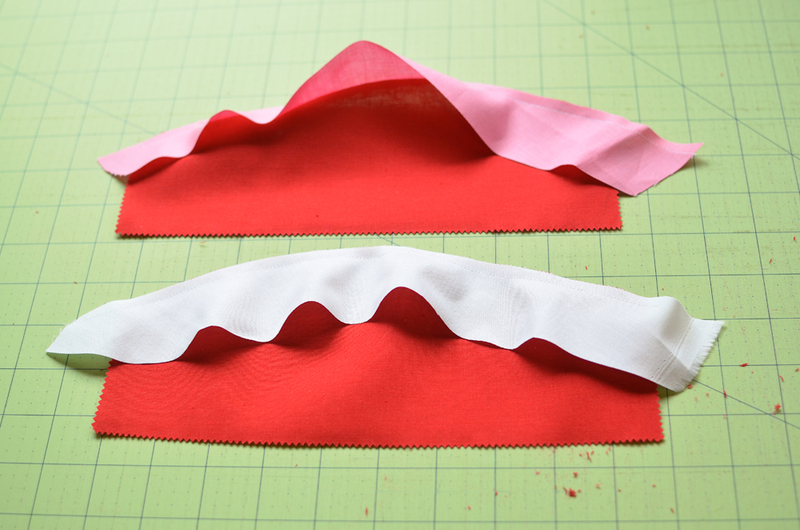 And then sew the completed the hearts. 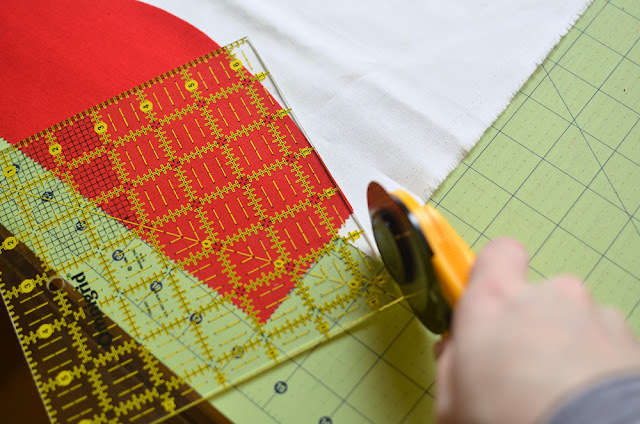 Sew the hearts together in a 2×2 grid. If you would like to use this as a wall hanging, here is a quick way to make some pockets for hanging. 1. Take two left over layer cake squares. 2. 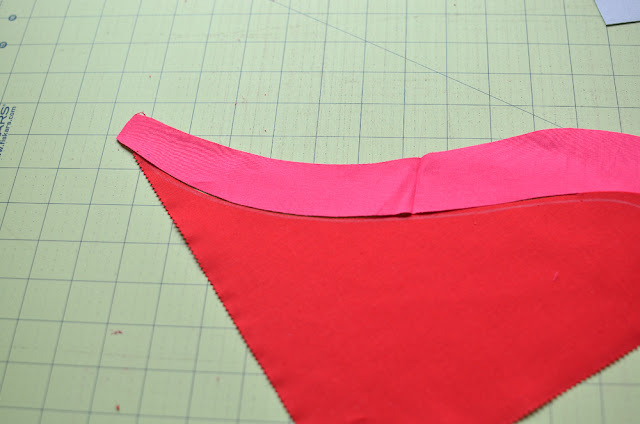 Fold the squares in half diagonally and press. They should now be right triangles. 3. Align the raw edges of the triangles with the raw edges of the quilt along the top right and left corners on the back of the quilt. 4. Stitch into place using a 1/4″ seam. This creates a pocket along each side. Just place a dowel in the pockets and hang on the wall. This entry was posted in Layer Cake, Moderate, Quilt, Seasonal and tagged Bella Solids, Kitchen Table Quilting, Valentine's Day.